Season 4 of the popular series NCIS: New Orleans starts on M-Net (channel 101) on August 30, 2018, at 19h00. Agent Dwayne "King" Pride has a team out of New Orleans' NCIS field office that is investigating crimes that affect military personnel. He's a local guy with a drive to do the right thing and leads agents Christopher LaSalle -- who plays almost as hard as he works -- and former ATF agent Sonja Percy -- who finds being a part of a team an adjustment after years of working undercover assignments on her own. Eccentric coroner Dr Loretta Wade supports them on cases. Together, they delve into the dark side of the colourful city that's a magnet for servicemen on leave. In the season premiere of the action-packed cop drama titled Rogue Nation, Pride remains on probation six weeks after his rogue takedown of the corrupt Mayor Hamilton. 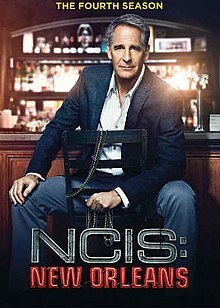 This series is a spin-off of the popular NCIS series. The cast includes Zoe McLellan as Meredith "Merri" Brody; Scott Bakula as Dwayne Pride; Lucas Black as Christopher LaSalle, Shalita Grant as Sonja Percy and C C H Pounder a Loretta Wade.